Eduardo Ponjuán graduated from the Provincial School of Art in Pinar del Rio in 1974, the National School of Art in 1978, and the Superior Institute of Art in Havana, in 1983. From 1986 to 1996, Ponjuan collaborated with contemporary Cuban artist René Francisco Rodríguez. As a collective, some of their most acclaimed shows were Call Malevich (Kunsthalle Düsseldorf and Kunstverein Lingen, Germany, 1996), Art and Comfort (Nina Menocal Gallery, Mexico DF, Mexico, 1993), Come and Give Me a Hand (23 and 12 Art Center, Havana, Cuba, 1992), and Melodramatic Artist (Castillo de la Real Fuerza Project, Havana, Cuba, 1989). He won the First Prize in Drawing at the Provincial Salon of Visual Arts (Pinar del Rio, Cuba, 1982 and 1985); the Drawing Prize at the City Salon (Provincial Center of Visual Arts and Design, Havana, Cuba, 1986); the First Prize at the Winners Salon (National Museum of Fine Arts, Havana, Cuba, 1987); and the First Prize in Collage at Malta Biennial (1999), among other important awards. Some of his most outstanding solo exhibitions are Salt (Villa Manuela Gallery, Havana, Cuba, 2007); Limbo (Habana Gallery, Havana, Cuba, 2003); I Have It on the Tongue's Tip (National Museum of Fine Arts, Havana, Cuba, 2003); Sense (National Council of Visual Arts, Havana, Cuba, 2001), and For Various Concepts (Habana Gallery, Havana, Cuba, 1999). His works are included in the collections of many important institutions, such as the National Museum of Fine Arts and the Wifredo Lam Center of Contemporary Art in Havana, Cuba; the Ludwig Forum für Internationale Kunst in Aachen, Germany; as well as various private collections. In 2007, Ponjuan received the National Curatorship Award granted by the National Council of Visual Arts for the exhibition Opera Rex (La Casona Gallery, Havana, 2006), and in 2013 he received the National Visual Arts Award granted by the Cuban Ministry of Culture for his lifetime achievements. Bizancio (Byzantium), 1998. Object (Book, found objects, rope, threads and screws), 17 x 9 1/2 x 5 1/2 in. La Edad de la Fe (The Age of Faith), 1998. Object (Book, paint brush, plexiglass, cut-and-pasted printed paper, found objects and screws), 11 x 9 x 1 1/2 in. La Edad de las Luces (Age of Enlightenment), 1997. 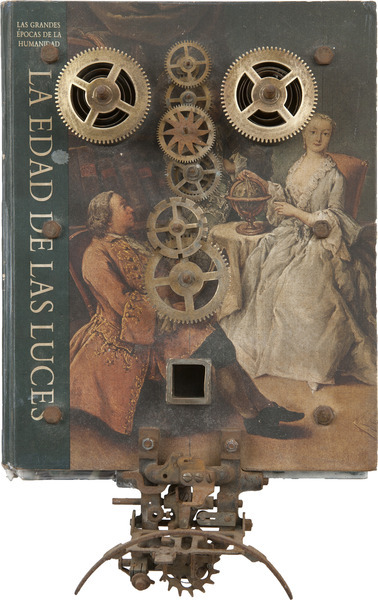 Object (Book, metal pieces and screws), 14 x 8 3/4 x 4 1/2 in. Sin título 3 (Untitled 3), 2000. 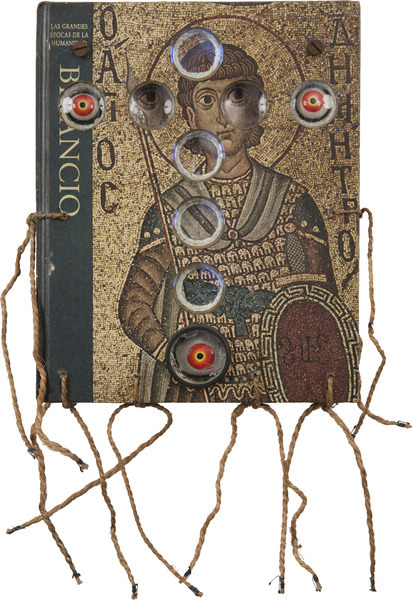 Object (Book, animal skin, rasp, marbles, crystal and metal pieces and screws, 13 1/2 x 9 1/2 x 5 1/2 in. El Renacimiento (The Renaissance), 1998. Object (Book, paint brush, metal, wood and screws), 15 1/2 x 8 3/4 x 4 in. Sin título (Untitled), 1999. 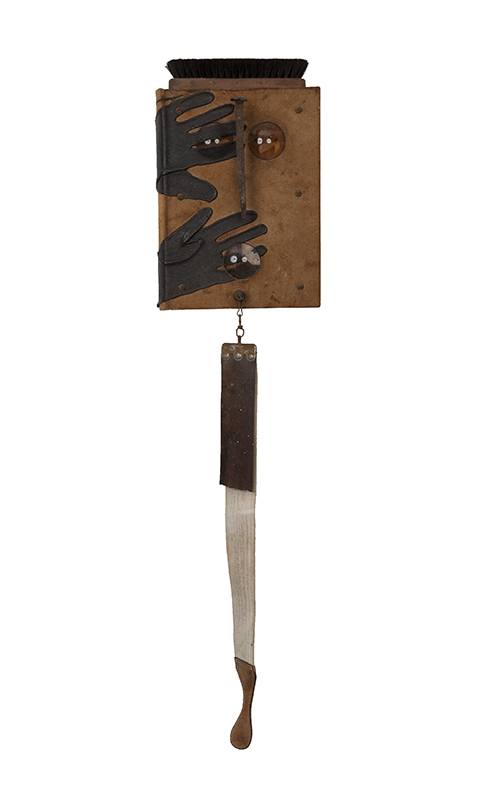 Object (Book, shoes brush, glass, railroad spike, fabric and leather belt, leather gloves and metal screws and hooks), 40 x 9 1/2 x 5 in.